Uluru - Overrated Rock or Australia Highlight? Uluru – Overrated Rock or Australia Highlight? One of the two waterholes at Uluru. After the Great Barrier Reef, I think it’s safe to assume that Uluru, aka Ayer’s Rock, is the second most well known “attraction” in Australia. 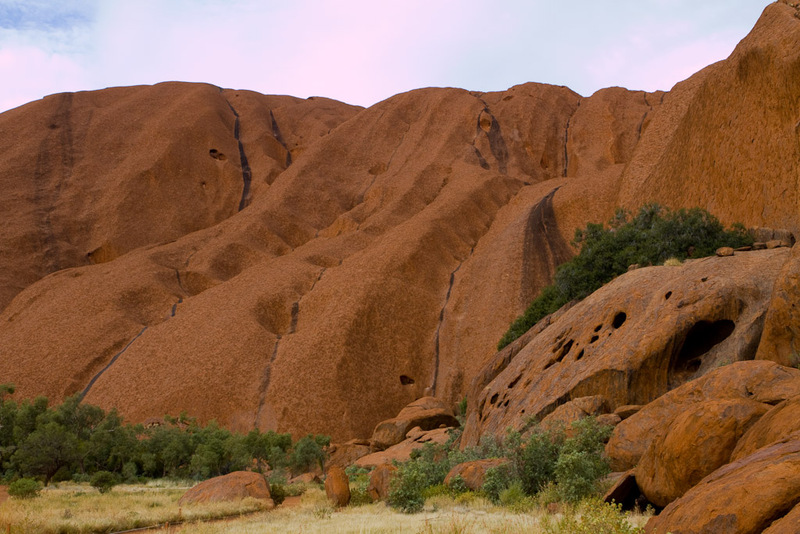 Located in the Red Center of Australia, this massive monolith is a very spiritual place for the native aboriginals. But is Uluru all it’s cracked up to be for travelers? Let’s start with the details. Uluru is 450 km (280 mi) by road from the nearest large town – Alice Springs. Listed as a World Heritage Site, it is one of two major features of the Uluru-Kata Tjuta National Park. This sandstone formation is 348 m (1,142 ft) high, with most of its immensity below ground, and is 9.4 km (5.8 mi) in circumference. A visit to Uluru takes a bit of work, as it isn’t really close to anywhere you are otherwise headed. Alice Springs is the nearest major town and the gateway to the “Red Center”. 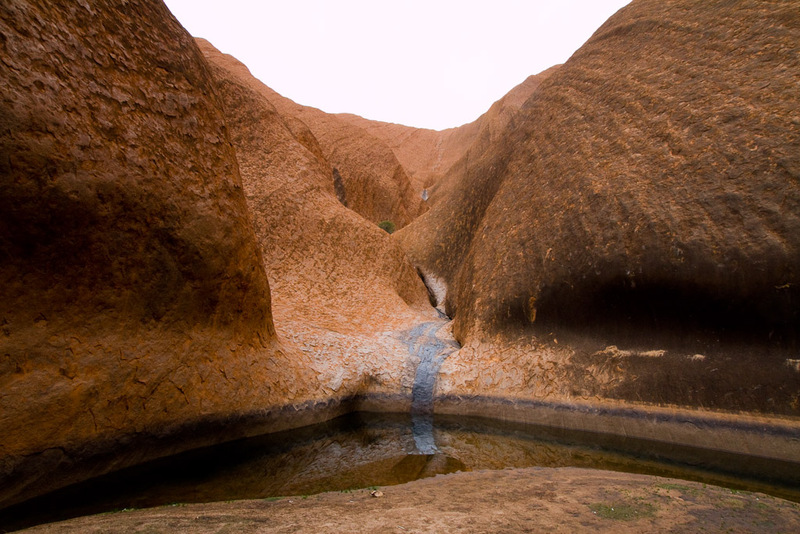 Plane, train or automobile, the only real reason a traveler makes the long journey to Alice is for Uluru. Once you’re there, a few other national parks and gorges are available to tour as well. 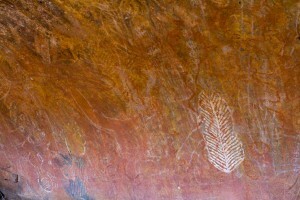 Aboriginal art on a wall at the base of Uluru. These spots helped communicate local information to traveling Aboriginals. Assuming you don’t have your own transportation, you basically have two options for visiting Uluru once you’re in Alice Springs: a 2- to 3-day tour that includes visiting other parts of the Red Center or a single day trip where you spend two-thirds of your day on the bus. Due to lack of time and the freezing temperatures at night, I opted to skip the multi-day camping tour and go with the single day trip. I should note here that the only accommodation around Uluru is extremely expensive and most backpackers and flashpackers will opt for a camping tour if they’re doing a multi-day tour. 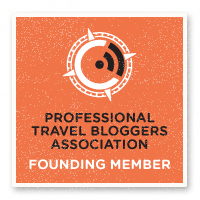 These tours usually provide a “swag”, which is a kind of solo tent, but you may be required to provide your own sleeping bag and pillow. My tour guides and bus for the day trip to Uluru with Emu Run Tours. 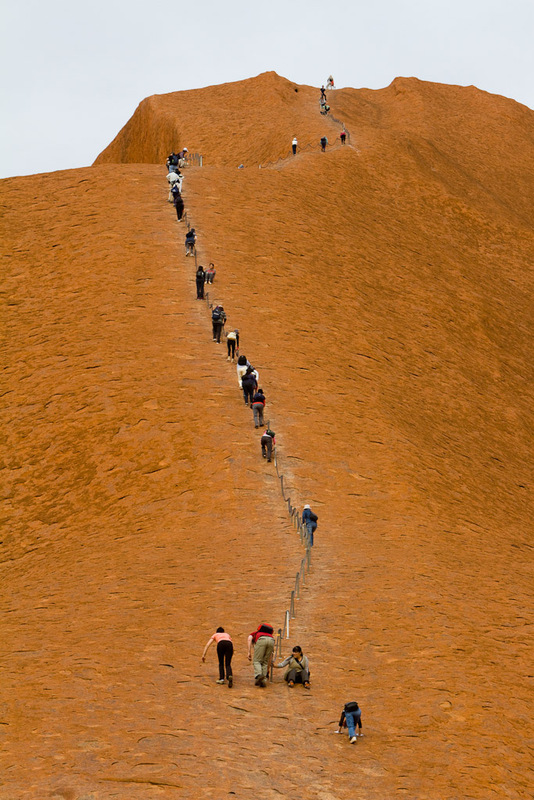 There are half a dozen tour operators running different tours to Uluru. 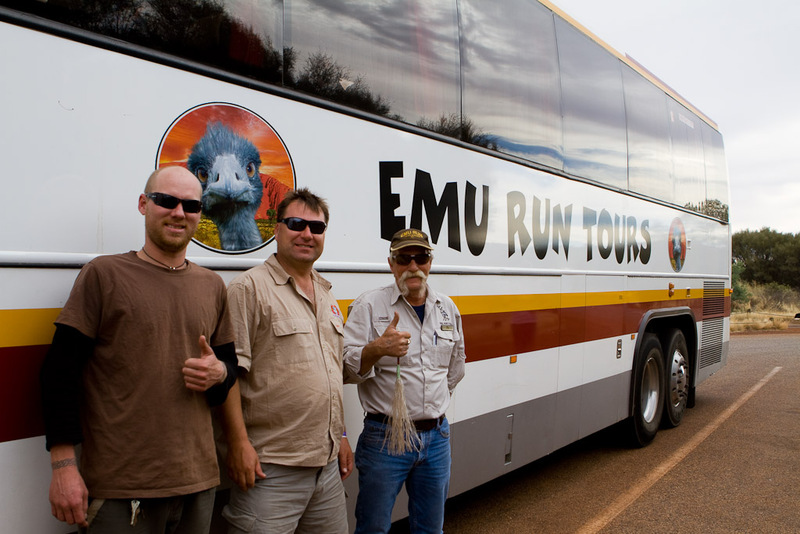 I opted for the single day tour with Emu Run Tours, who also offer multi-day camping tours to Uluru and other parts of the Red Center. As stated above, two-thirds of the day is spent on the bus getting to and from Uluru-Kata Tjuta National Park. We arrived at “The Olgas” at about 12:30 and wandered there for about 40 minutes before heading off to the star of the show. A quick 30-minute stop at the visitor’s center puts everything into perspective. You learn a bit about the aboriginal stories associated with this spiritual icon as well as a lot of detail on aboriginal culture. There is also a display requesting that you refrain from climbing Uluru and the reasons for that request. 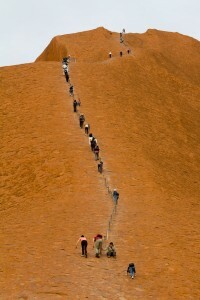 The climb up Uluru is assisted with a low chain, but still a difficult climb that causes many deaths each year. The first stop after the visitor’s center is the base of the climb. There is plenty of debate online whether or not to climb, so I won’t go into too much detail here. Basically – it’s a highly spiritual site for the indigenous people and they don’t want you to climb it, so don’t. There are plenty of hills, mountains and rocks to climb – why tramp on someone’s history? So, you are given the choice to climb, or to take some of the guided walks around Uluru and hear the stories associated with different parts of the area. Out of 33 people on our tour, I think 5 chose to climb. Whichever you choose, you’ve got about 90 minutes before getting back on the bus to get to the sunset viewing spot for dinner. With Emu Run, we had a BBQ champagne dinner as the sun set that consisted of sausages and 12 different kinds of salad. We didn’t expect the sun to make it through the clouds, but we lucked out with 30 seconds of sun right as it set, turning Uluru a light shade of red. All in all I’d say the tour was great. I’m not normally one for big tours like this, but figured it was the only way I’d make it to Uluru. The guides were very knowledgeable and provided commentary most of the trip there and all through the national park. The ride was smooth, the food good, and the information more than I expected. A closer view of the terrain of Uluru. Is Uluru worth all the trouble? If you’re interested in aboriginal culture, then yes. The visitor’s center and the tour guides provide you with a wealth of information about their way of living, the plants and animals of the area, and the spiritual significance of Uluru. If you’re just curious about it all, then you’ll have to weigh your curiosity with your time and budget constraints. If you’re just going to climb it and say you’ve been there, skip the trip and climb something bigger and better. You’ll save time, money and you won’t go stomping on another culture’s past. the actual experience is worth going there. Yeah, don’t see the point in traipsing over another culture to do a climb you could do any number of other places. Who told you it ’causes many deaths each year’?? Maybe a bit of fact checking is order – I’m pretty sure the last death while climbing was in 2010 and that was the first in around ten years.